I've been fascinated with Anna Prohaska since this came out several years ago. Her latest album, Serpent and Fire, displays a similar flair for the theatrical, and still more range of vocal color. The title alludes to two great queens of myth and history, Dido and Cleopatra; the disc explores how they were characterized on the operatic stage. I had never before considered the fact that these two larger-than-life figures proved so popular in early opera, and now I can't stop thinking about it (or listening to the CD.) 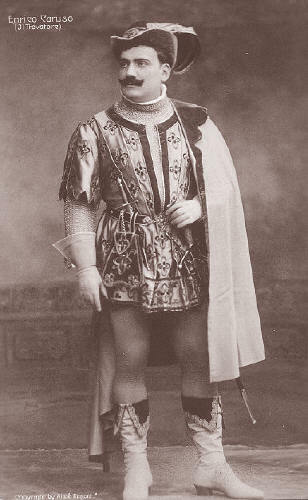 The brief essay accompanying the disc--on the different operatic styles developing in the seventeenth century, and their different approaches to portraying the queens--argues that there is "nichts von das Ewig-Weibliche" in this popularity; this may be an excessively optimistic assessment. True, the queens are very different from each other. Moreover, as the disc showcases, the ways they were dramatically and vocally characterized could vary widely. Still, I find it suggestive that these two powerful and alluring queens of myth/history were so frequently staged at a time when state power, as embodied by the rulers of Europe, was threatened, redefined, and (to a considerable degree) gendered male. What did it mean to show these queens conquering and conquered? I've written elsewhere about the uses of Anne Boleyn as romantic heroine; it strikes me that a similar (more scholarly) investigation into these questions would be warranted. Prohaska's musical exploration is very welcome, covering three languages, two different settings of a Metastasio libretto, and showcasing her impressive range of vocal technique and emotional expression. In about a month's time, I will see the Met's new Tristan und Isolde with my mother (her conversion from opera-skeptic to budding Wagnerite is chronicled here.) We're both very excited. After I described the plot to her, she said she thought she'd like to look at the words, and asked if they were printed anywhere. I joyfully assured her that they were, and promised to lend her my libretto. In digging it out of my untidy collection, I discovered that I own not the modern red-and-white edition, but something far more interesting: this fabulous artifact. It includes a full-page endorsement of Knabe pianos by Göta Ljungberg, and a deliberately archaic English translation, oddly sprinkled with pseudo-medievalism. ("O, er weiss wohl warum!" becomes "Oh! he wots well the cause.") The missteps may be many, but Isolde's contemplation of the waves in the Liebestod, asking "Shall I sip them, / dive within them, / to my panting / breathing win them?" struck me as surprisingly effective in its ecstatic eroticism. The libretto also includes an "extra": a piano version of the Liebesnacht! I was fascinated by this, richly evocative of an audience expected to have the skills and desire to take the music home with them in this way, whether to an upright piano in a corner or to a far grander instrument and leisure to play it in. But even more interesting to me was the note by the libretto's first owner: "March 16, 1934 -- At the Metropolitan with my most beloved cousin -- The greatest performance -- Tristan + Isolde / Henry + Julie Grün." As this blog makes clear, I'm usually more likely to be attracted by records involving German orchestration and unfulfilled longing than by cheerfully-titled discs of bel canto. 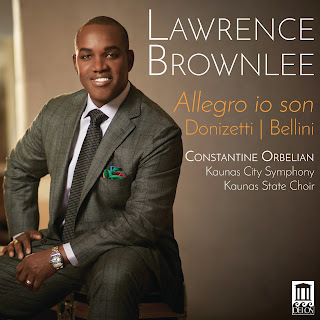 The artistry of Lawrence Brownlee, though, drew me to his new album of Bellini and Donizetti, Allegro io son, and I've been listening to it repeatedly. 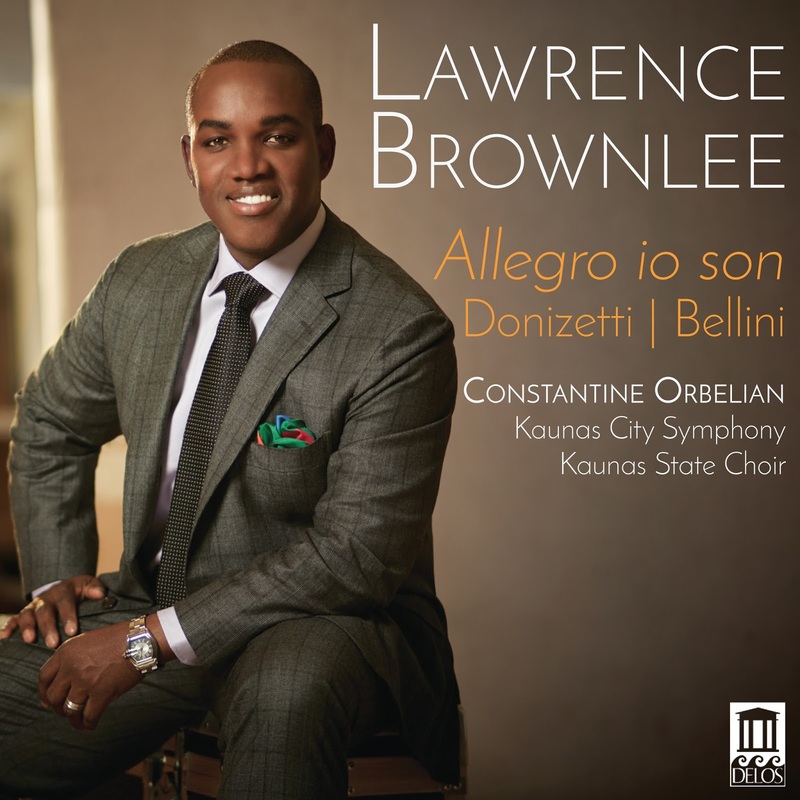 It's a thoughtfully put-together disc, and one that admirably showcases not only the versatility of the composers, but Brownlee's own remarkable vocal and emotional range as an artist. Both his talent and his generosity as a performer are richly displayed. The Kaunas City Symphony Orchestra and the Kaunas State Choir, sensitively led by Constantine Orbelian, provide support of high quality. Summer weather is beginning to transition into that of fall, which means it's time for me to transition from French to German art songs as my default listening of choice. 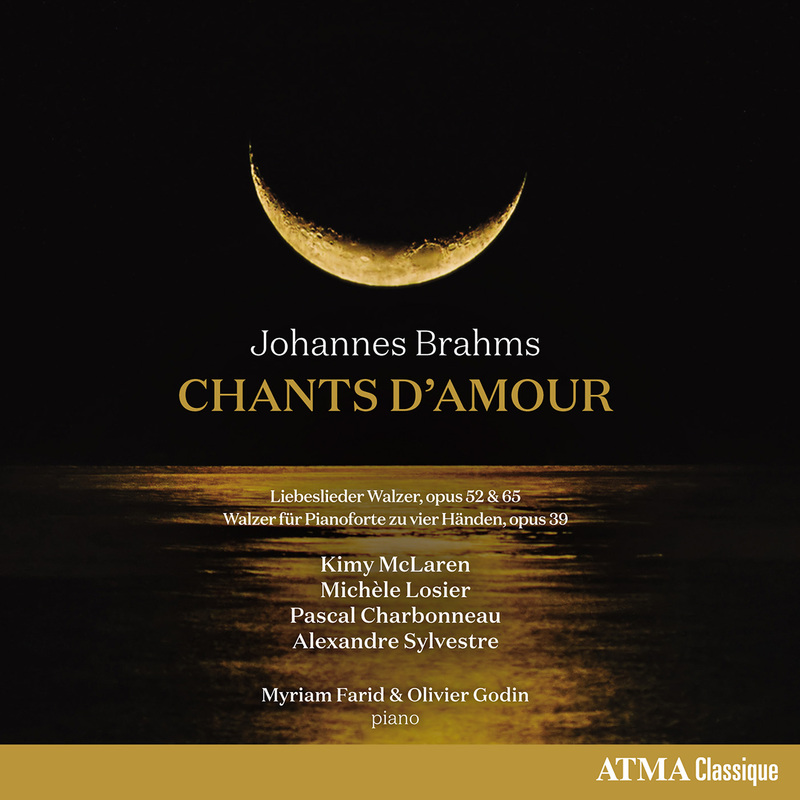 Perfect for this lazy, enchanted, in-between period has proved a new recording of Brahms waltzes, here identified as Chants d'Amour. 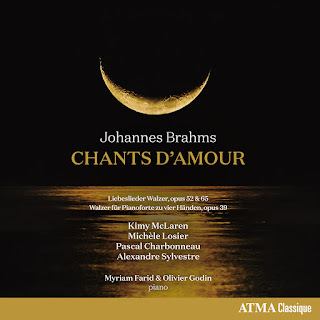 Inexplicably, I have struggled in the past to come to grips with the Liebeslieder Walzer, but this rendition was light and seductive, yet not without its core of seriousness and melancholy. (If a song cycle doesn't have a core of melancholy, I'm rarely interested.) Here, Op. 52 and Op. 65 bracketed the four-hand waltzes of Op. 39. It doesn't feel overstuffed or overlong as an album; tempi are often faster than I've heard elsewhere, without feeling rushed. I found the collaboration of the musicians impressive throughout. New York is a city I still think of as home, and not least among the many things I miss about it is its operatic ecosystem. So it was a special pleasure, on my latest visit, to find opera right in my academic backyard. The much-tried NYCO is currently trying out free outdoor opera. The large, diverse, and multigenerational audience that gathered last evening in Bryant Park would seem to confirm the wisdom of the strategy. I was encouraged to see how ready such an audience was to devote part of a summer evening to opera. The offered Carmen turned out to be a much-reduced version of Bizet's big, brutal, beautiful work. In scarcely more than an hour we were through, famous excerpts having been strung together with summarizing narrative. I expect that the next planned park opera, Pagliacci, will be much more successful in offering a taste of opera, since the company will be able to offer the whole work. And of all the scores to put in piano reduction, that of Carmen is surely one of those that must suffer the most from losing its color, its noise, and its vital pacing. I still enjoyed the opportunity to hear more of NYC's singers. Academic travels have taken me to Paris; this loveliest of cities doesn't currently have opera to see, but it does, of course, have what may be the world's most opulent opera house. I was happy to discover that the Opéra Garnier makes a good destination for the opera-loving tourist. Its Second Empire splendors are impressive in their own right... and this is an understatement; they are overwhelming, and intended to be so. Still, many of its pleasures, at least for me, come from the fact that it has such rich historical and literary resonances. As the home of the Paris Opera, it has inherited and preserved the holdings of the opera's earlier architectural incarnations. 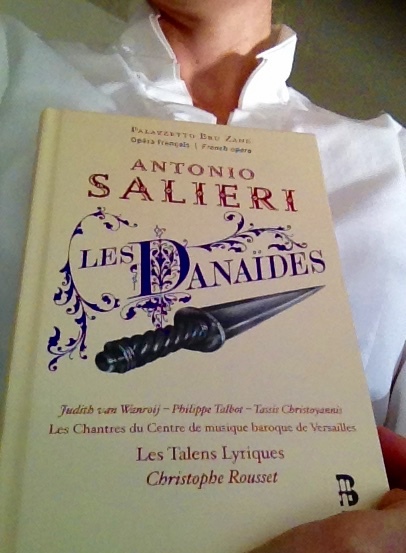 It's easy (if slightly anachronistic) to imagine the Count of Monte Cristo in one of the boxes; Dumas' mysterious protagonist loved the opera, particularly Guillaume Tell. The opera house itself, famously (or infamously, perhaps) becomes a protagonist itself in Gaston Leroux' extraordinary fantasy of fin-de-siècle decadence. Today, the house offers pleasures both scholarly and frivolous. Notable opera composers are quasi-ubiquitous within the house; Gluck and other luminaries of the French baroque welcome hypothetical opera-goers in the foyer (this isn't where one enters as one of hoi polloi getting a ticket to see the house alone, but you can and perhaps should go around and imagine yourself sweeping up the staircase.) The staircase is, of course, a wonder to behold. It is so entirely unrestrained, so much an apotheosis of its type, that I succumbed to it entirely. 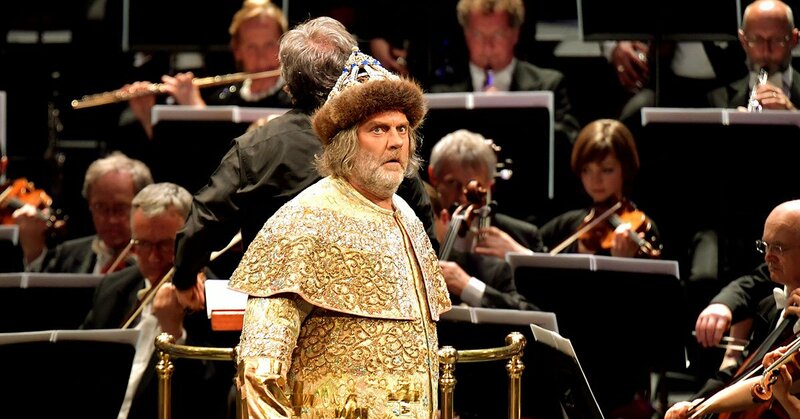 It was due to a timely Tweet from the Royal Opera that I found myself, on Saturday night, happily making part of the throng in the arena of the Royal Albert Hall, eager to see the grand spectacle of Mussorgsky's Boris Godunov distilled into a semi-staged performance. It's impressive to me, incidentally, that the turnout was so good; I was able to get a last-minute ticket, but still: two hours of Russian is two hours of Russian. I was fascinated by it. Not only did the evening provide a chance to hear Mussorgsky's score without the posthumous fillings-out and fillings-in that have become usual to it, but it provided me with my first live hearing of Antonio Pappano's conducting, and renewed proof that Bryn Terfel is one of the finest stage actors in opera. The 40 days of Lent: season of prayer and fasting for adherents of Christianity, and of Requiems and Passions for devotees of classical music. With a seasonally appropriate release date of March 25, Crossing Over, the new album of the choral ensemble Skylark, answers the question: what might musical meditations on mortality look like without religious affiliation? The results are musically creative and intellectually rich. Indeed, the musical substance of the album--available for pre-order here--is weightier than the somewhat fulsome accompanying text would suggest. (The expressions "near-death experiences" and "pseudo-consciousness" raised only skeptical alarm in me.) Composers of several generations and traditions are represented. Works by Nicolai Kedrov and Jón Leifs date to the first half of the twentieth century; song cycles by William Schuman and John Tavener to the latter (and just beyond.) Daniel Elder, Robert Vuichard, and Anna Thorvaldsdottir represent the generation of composers who have come of age in the twenty-first century. 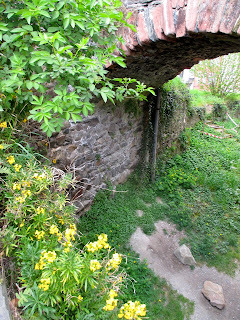 I mention this as a matter affecting the spiritual textures of the works, almost more than the musical textures. 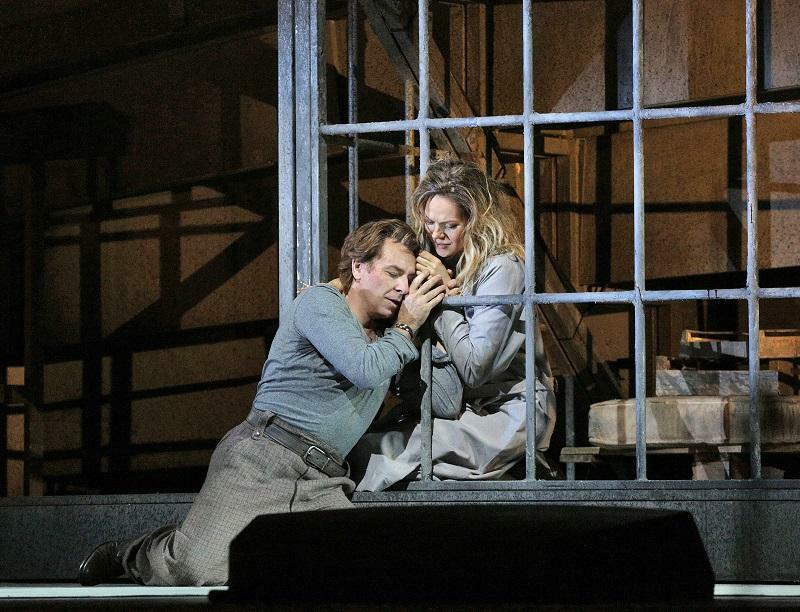 I got to see Tuesday night's performance of Manon Lescaut, and I'm very glad I did. Hearing Kristine Opolais live for the first time was a highlight. 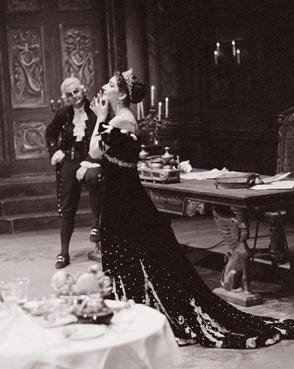 Despite the infamously unsatisfactory development of Manon's character, her singing was both sensitive and thrilling. Also a pleasure was the ardent Des Grieux of Roberto Alagna. 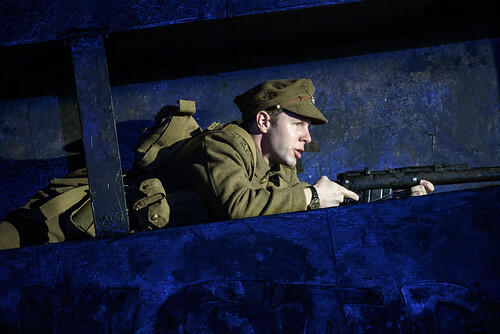 The lovers were supported by a strong cast, a lush orchestra, and a production that speaks my emotional language. To be honest, despite Richard Eyre's undoubted expertise, I wasn't sure how his Manon Lescaut would turn out (I'd found his recent Met Nozze deeply disappointing.) In the event, I found the production very effective. Not only is the stylized visual vocabulary of 1940s film a sure way to my heart and the breaking of it, but the historical setting of Occupied France was used to provide meaningful external pressures on both of the lovers. If there was anything lacking, it was only an indefinable spark... but I luxuriated nonetheless. While recently attending a conference, I took time off to attend a very alliterative concert. Harry Christophers helmed the Handel and Haydn Society in a concert devoted to Beethoven at Boston's Symphony Hall. It was satisfying and stimulating to listen to, as well as to name. My brain being reduced by the weekend's academic labors to something like mush, my notes will be brief. I'm making them anyway because Friday night's concert offered me the exhilarating experience of hearing a beloved composer in new ways. The evening opened with a nod to Handel, with a crisp rendition of the "How Excellent Thy Name" chorus from Saul. The forces of the Collaborative Youth Concerts were impressively professional in manner and expressive in diction. I'm sure there's been scholarly ink spilled on the political and social significance of Old Testament oratorios, and the orchestra's vibrant performance had me wondering where I could find it.